About — Indie. Boho. Metal. 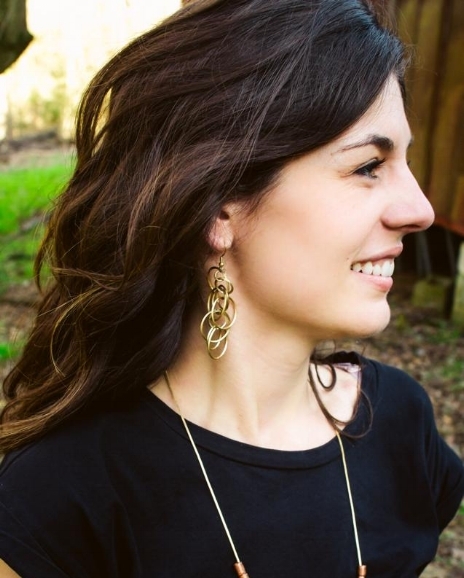 Alex Nelson, Chattanooga Jewelry Designer, creates pieces that are unique, fashionable, and fun. Alex graduated from the University of Tennessee at Chattanooga in 2009, with a B.A. in Spanish. After college, she began experimenting in jewelry design with items found in her recycling bin. What began as a hobby, rapidly evolved into a small business. IN 2011, Spun Jewelry, now Indie. Boho. Metal. was born. Alex strives to use recycled materials for their eco-conscious, affordable, and one of kind characteristics. Her Designs Incorporate post-consumer materials such as paper, plastic, salvaged wood, and recycled metals such as titanium, brass, copper, aluminum, and tin. Other pieces are created using beads, wire, cast-resin, and polymer clay. The goal is to evoke nostalgia, style, and imagination through inventive design. Inspired by basic geometric shapes and stunning bold colors, Nelson seeks to combine elements into beautiful pieces with a geometric flare. To start off, raw brass or copper is cut, cleaned, and hammered before the patina process and finishing steps can be done. All fabrication is done at her home studio in Chattanooga, TN. Through a lot of experimenting, Nelson has developed her own combination and spin off of many common patina recipes -who knew that by making a mess you could occasionally produce beautiful, unique colors using natural methods. All of her patina pieces are made in her studio in small batches, by hand. She strives for the most organic methods possible. The most thrilling part of of the natural patina process is that no two pieces are the same - color and intensity will vary. A verdigris patina could produce colors from a turquoise to sea foam green depending on many factors such as temperature and humidity. Once a piece has gone through the patina process and is set, the patina is sealed in with an eco-friendly lacquer. This ensures that the patina color will remain unchanged and will not flake or rub off. Brass jewelry is polished and waxed to ensure continued shine. Recycled materials such as paper, plastic, salvaged wood, and recycled metals such as titanium, brass, copper, aluminum, and tin. Unfinished brass jewelry will naturally darken/patina over time and this process is accelerated with the less frequent wear. To brighten brass jewelry, use a polishing cloth or gently rub with natural lemon juice mixed with water. Avoid prolonged exposure to water and store in a dry place. With sealed patina jewelry, clean by washing gently with warm water. Avoid rubbing vigorously and contact with sharp objects in order to ensure continued protection of the patina sealant.